You have spent time and money to have your nails look perfect. Your hands are wonderfully soft too. It’s a shame all this effort goes to waste as soon as you start using cleaning and washing products – but it doesn’t have too! If anyone remembers the well-known brand of washing up liquid that promised to make your hands as soft as your face, you’ll know the song that’s going through my head. Having soft and subtle hands can make the world of difference to how you feel. Especially in the winter months when they are dryer, rougher and can be painful if left un-moisturised. Using natural products on your hands and nails not only helps moisturise them but may also help protect them. Winter is coming, so to keep our hands and nails in tip top condition, prevention Is often better than cure. Here are our 3 simple steps to keeping your hands soft, smooth and lovely in the months to come. Before you leave in the morning, moisturise your hands. Organic Argan, Jojoba, Rosehip or Avocado are all suitable oils. Or perhaps you have one you prefer? Use whatever you find most beneficial for you. Moisturising your hands before you leave in the morning is probably one of the most important things you can do to keep the skin on your hands protected. If you moisturise your face with a natural base oil, you can use what’s left on your hands, or add an extra drop into your hands and give them a good, quick massage. In this way you don’t have to remember to moisture your hands as it is just a consequence of moisturising your face, easy. You can easily make your own hand scrub using fine Himalayan salt, you might want to crush this to make it fine enough for your particular skin or you can use a sugar. Add your choice of carrier/base oil and a few drops of essential oil (always check that the essential oil is suitable for you, if you are pregnant or breast feeding it may be advisable not to use essential oils). Gently wipe the scrub across your hands. Using a scrub once or twice a week may help leave your hands smooth and soft, exfoliating and removing dead skin, and moisturising at the same time. It also makes your hands smell wonderful. Just remember to use ingredients you like the smell of! You may need to rinse your hands with water or wipe with a hot cloth afterwards. Argan is considered by many to be good for helping to improve weak and brittle nails and may also be good for cuticles. Massage a tiny drop into each cuticle and nail once or twice a week. Once you’ve finished massaging, remove the excess oil. 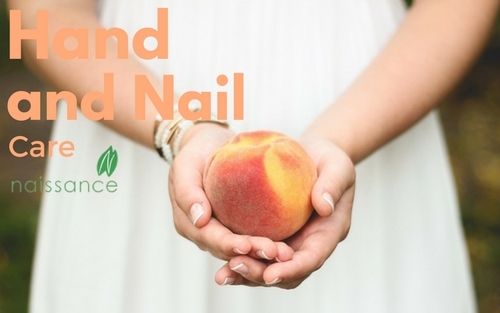 This routine may improve the condition and strength of your nails. You can also use the Argan Oil to moisturise your hands. Always remember to do a patch test before using any new oil. Argan oil has been known to cause reactions in some people with nut allergies. Everyone is different so it is always important to make sure that the natural ingredients you are using are right for you. We hope this has been helpful but what have you found works best for your skin type. Do you have any secret remedies you can share? Do please let everyone know.